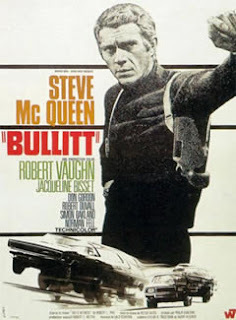 Tag line: "There are bad cops and there are good cops - and then there's Bullitt"
Steve McQueen, who as a young man spent time in both reform school and the United States Marine Corps, knew how to play it tough. A performer with incredible charisma, McQueen also possessed an obvious inner strength, building within each of his characters a street-wise sensibility that served them well in times of crisis. Yet of all the rugged, no-nonsense individuals he would portray throughout his career, few were tougher than Frank Bullitt. A San Francisco detective, Bullitt is assigned to keep an eye on mobster Johnny Ross (Pat Renella), an informant who's agreed to testify against his organization. While under Bullitt’s protection, Ross is shot by an unknown assailant and left for dead. Though in a coma, Ross survives the attack, and when word hits the streets he's still alive, Bullitt uses the injured mobster as bait to lure his would-be assassins out of hiding. But a local councilman named Walter Chalmers (Robert Vaughn), who planned on using Ross’s testimony to further his political career, has threatened to ruin Bullitt for failing to protect his star witness. From that moment on, Bullitt finds himself hounded by his superiors, and forced to answer probing questions about his ongoing investigation. Ultimately, Bullitt must deal with the fact he’s not only battling the criminal element, but the system as well. Bullitt is an engaging police drama with a hard-nosed central character, yet it will always be remembered for its car chase through the streets of San Francisco, a sequence I found every bit as exhilarating as the chase in William Friedkin’s The French Connection. What begins as Bullitt tailing a pair of suspects quickly devolves into a dangerous game of cat and mouse, with both cars flying at top speed over the city's steep hills. Director Peter Yates went out of his way to raise the tension in this scene, mounting cameras in the back seats of both vehicles to give us a closer look at just how dangerous the chase was becoming. It’s a thrilling sequence, but a nerve-racking one as well, and more than a little frightening. “If I hadn’t made it as an actor”, McQueen once said, “I might have wound up a hood”. As it stands, his performances were a combination of the two. Considered one of the best of his generation, McQueen was also a recluse, who carried his unflinching personality with him into every role he played. Even as Frank Bullitt, you can't miss that Steve McQueen persona shining through. This is a sadly underappreciated film for modern audiences, one that has strangely fallen by the wayside. I'm not sure why. Almost every "renegade cop on a mission" film owes a huge debt to Frank Bullitt. One thing I like about this film more than many that followed is the Bullitt is loyal to his own guys--unlike the one-man army cops of the '80s and beyond, Bullitt battles with the guys above him, but understands his own team and trusts them. He's not on his own and knows he can't do it by himself. Thanks for stopping by once again. I appreciate it! You make an excellent point about the camaraderie Bullitt experiences with his direct peers...it's really only the upper echelon giving him trouble. And yes...this film had been almost forgotten. A real shame. Simply an example to every aspiring film maker. Skooal: Thanks for stopping by, and for the comments. And I couldn't have said it better myself! See you on Twitter, and thanks again! Really enjoyed this. Like you, I'm surprised this has been largely forgotten. To be honest, I'm kinda shocked it hasn't been remade since the story should translate pretty easily. If you'll notice in those car-chase scenes, that same VW keeps showing up as an "extra." I agree about the car chase being filmdom's best. The movie had a few plot flaws, but who cares? Outstanding character in Frank Bullitt. Simon Oakland as Frank's boss is an underappreciated character actor. A great movie, and THE best car chase sequence in the history of motion pictures.